Egyptologists have known for a long time that the Great Pyramid was built by a king called “Khufu”, or "Cheops" as Greek historian,Herodotus, (often called the "father of history") recorded this after a visit to Egypt in about 470 BC. And, in the 3rd century BC, the Egyptian high priest Manetho noted that it was built by Suphis who was called Cheops by Herodotus. Furthermore, in the tombs around the pyramid the first scientific excavators of the early 19th century found a proliferation of name cartouches (royal names enclosed in a rope oval) that could be read as "Suphis". No inscriptions were found inside the pyramid because in common with all other pyramids of that era, it was devoid of any decoration (I will be discussing the reasons for this in a later section). So the ultimate evidence for Khufu as the builder of this pyramid had not yet been found. But in the late 18th century, just above the ceiling of the King's Chamber, a small space was discovered reached via a small tunnel. "Where there's one there might be more" thought Colonel Howard Vyse, and, in 1837, he proceeded to carry out excavations there. Using gun-powder, he blasted into the fabric of the pyramid, and so discovered four more small chambers, which, from bottom to top, he named respectively Wellington, Davison, Lady Arbuthnot and Campbell (Z2-Z5 on the accompanying plan)[1 ]). The chambers were never intendes for use by human beings. Instead their function was technical; they had been designed to raise the gabled load bearing roof of the chamber to a position where the horizontal forces excerpted by the roof would be unable to damage the "Great Gallery". For this reason these chambers had no entrance, and had been sealed since the completion of the levels on which they were located. Unless the upper half of the pyramid had been torn down, there would have been no possibility of finding a way into any of these chambers. Everything inside them had to have been undisturbed since the time of the pyramid's construction. But, within these chambers, Vyse found inscriptions. And at least one bore the name of Cheops himself, Khufu, as his name in its written Egyptian form. The ultimate evidence. But, think some authors, too good to be true, because this "evidence" is nothing more nor less than faked. The author Zecharia Sitchin claims that the only cartouche found in the pyramid spelling out Khufu's name is a forgery, recognizable through a spelling mistake. According to Sitchin, the name was not written with the correct signs, i.e. : "Sieve, Quail, Viper, Quail" (representing the consonants "Kh-Wu-F-Wu"). Instead of a “Kh”, a circle with several lines, the name began with the solar disk "Re", a circle with a single dot in the middle. The name in the pyramid would therefore be pronounced as "Re-ufu". An explanation for this mistake – one that an ancient Egyptian scribe would have found unthinkable – might nevertheless be found in the context of the events of 1837. Sitchin describes how that particular year had seen the publication of a learned study of hieroglyphics, Materia Hieroglyphica, in which the name of Khufu was written with an error: the lines of the sieve were so close together, that they appeared in the print like a solid disc, which was another way of writing "Re". And (writes Sitchin) it is known, that Vyse had this book with him on his excavation. Well, if there really was such a mistake in the cartouche, then this inscription is without doubt a forgery. This would mean that the whole link connecting this particular pyramid to Khufu was broken. And archaeology would find itself faced with an enormous scandal. 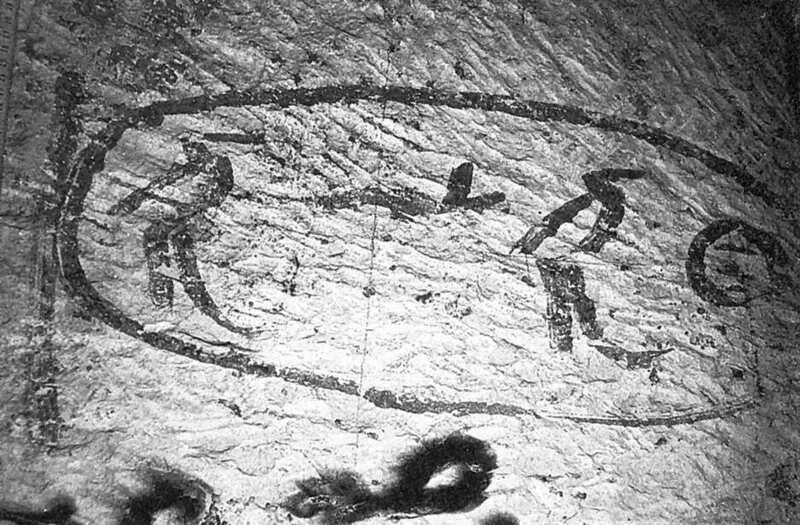 Sitchin uses various drawings to document his claim. In Stufen zum Kosmos, the German edition of Stairway to Heaven, he includes some images[3 ]. And, on these images. the ancient spelling error can clearly be seen. Unfortunately Sitchin gives no source for these images: - which is rather a shame, because they are wrong!!! I first saw the correct cartouche – with the “KH” as a circle containing three dashes – on a TV documentary the Britsh TV somewhere in the 1980's, but since I ws not interested in it at that time, I forgot about it. I later saw it in a re-run, and in a book by Geman Egyptologist Rainer Stadelmann, first published in 1985. [4 ]. And, since that time, severeal more books containing photos of the cartouche in question have been published. On all these images. the first hieroglyphic looks just as it should: a circle with several horizontal lines inside it. The hieroglyphic is no "Re" at all! Sitchin's principal evidence for a forgery is itself bogus! This just take one's breath away. Sitchin's main evidence for the forgery does not exist. So, at this point, we might be justified in halting any further examination of this theory, concentrating instead on the question of how an acclaimed historian like Sitchin could make such a mistake. When Sitchin first published Stairway to Heaven, the books listed above had not yet been published. All the documentation and reports published up to that date on the subject of these particular inscriptions consisted largely of illustrations - even today a good ollustration is often better than a photograph. This leaves one possibility: - perhaps it was the drawings that were wrong. 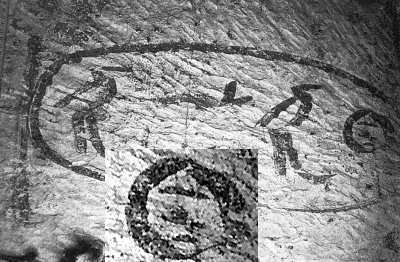 Perhaps Vyse's team of excavators found a "Kh", but expected a "Re" (since it was written that way in the contemporary work of reference), and therefore drew a "Re" in their reports. And the unwitting Sitchin innocently stumbled into this trap. During zhe course of an increasingly frustrating discussion between a mamber of the junior section of the A-A-S- (Research Organisation for Archaeology, Astronautics and SETI) and a person ho once called himself "Germany's greatest UFOlogist" who was defending his friend Sitchin, extreme forms of evidence were requested as proof, that those cursive signs really did appear in the first edition of Vyse and were not simply corrections in a later reprint (Vyse's Operations were not yet online then). Therefore Sitchin's friend wanted to see the front page of the volume in which the hierogllyphics in question are reproduced. So here it is. To return to our subject: The cartouche in Perring looks different from Sitchin's image. For example, the tail of Perring's serpent ends with an upward turn, whereas the tail of Sitchin's serpent turns slightly downward. Sitchin's image bears a greater resemblance to Vyse's facsimile, although Sitchin doesn't list this book as a source. But one thing is clearly visible: in both sources, Vyse and Perring, the small outline inside the circle consists of three horizontal lines. So both images unmistakably show a "Kh" and not a "Re". And while we can see that Sitchin's small image on the left is clearly taken from Vyse's report, we can also see that his "enlargement" on the right is no enlargement at all, but an entirely new picture (the quails are depicted in a different way, while the snake has more curves, and is portrayed on the slant, rather than horizontally), probably drawn by Sitchin himself - and faked! Sitchin did not discover a forgery: shockingly he produced one himself, in order to provide evidence for his forgery story! The fact that no one seems to have noticed this falsification of the original source by Sitchin indicates even further failures to check the evidence in any scientific way. The books by Perring and Vyse also incidentally demolish another ploy put forward by the Sitchin adherents. Some people claim that the inscriptions in the relieving chambers, correct though they might appear, are in fact forgeries put in place by present day Egyptologists after Sitchin had found out about the spelling mistake. So Egyptologists went into the chamber, armed with a pot of red paint and a brush, and corrected Hill's mistake. And this is the reason why the paint hass not been carbon dated – because the fake paint would then be detected. But since the books published in 1839 and 1842 already show the correct spelling, this scenario is simply impossible - only a fully-functioning time machine could make it work. But such considerations are of little concern for the die hard upholders of the forgery school, who, needing it for their own pet theories and/or books, still claim that the hieroglyphics were forged. The German author Thomas Fuss explains why:: "These inscriptions do not fit into the context indicated by other circumstatial evidence, such as biblical stories and the Hitat legends. The inscriptions must therefore be fakes." But there is clear evidence, even in the first report by Perring, that the inscriptions COULD not be fakes. 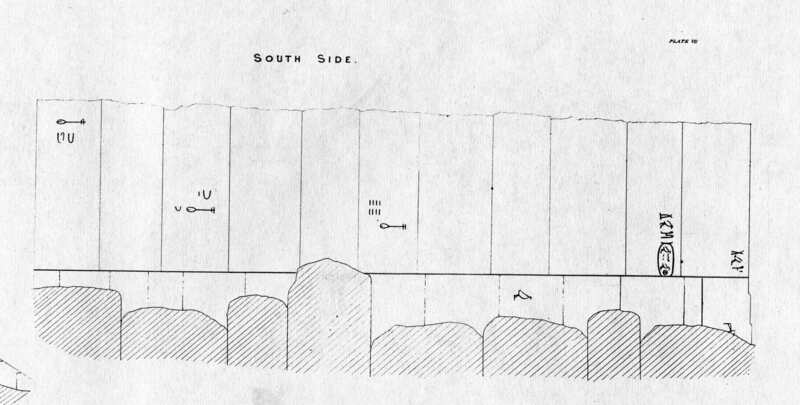 On Perring's Khufu-plate VII we can sees on the sub-plate “North Side” we find a cartouche (shown here on the left of this page in fig. 8, turned at a 90° angle). This is clearly the last part of the Khufu-name, the rest of it is hidden behind the heavy floor blocks. Traces of this inscription, and others, can be glimpsed in the cracks and joints of the walls, written in places where no forger in the world could write anything. The only way of putting the inscriptions there would be by lifting the heavy floor blocks – weighing anything up to 70 tons – inserting the forgd inscriptions, and putting the blocks back into position - impossible! "There were no restrictions on where I looked and I had ample time to examine the hieroglyphs closely, under powerful lights. Cracks in some of the joints reveal hieroglyphs set far back into the masonry. No 'forger' could possibly have reached in there after the blocks had been set in place - blocks, I should add, that weigh tens of tons each and that are immovably interlinked with one another. The only reasonable conclusion is the one which orthodox Egyptologists have already long held - namely that the hieroglyphs are genuine Old Kingdom graffiti and that they were daubed on the blocks before construction began." Another argument in favour of the forgery hypothesis has been suggested by the best-selling German author Erdogan Ercivan. He maintains that inscriptions which continue around the edges of wall blocks could not ever have been written by any Egyptian the reason being that there was ample space on the blocks for any neceessary inscription to be written on one face. But sometimes I wonder if those authors spare even a moment to consider their "evidence". If it is impossible to have bona fide inscriptions that disappear out of sight behind a floor block, it is even more impossible for a forger to write into the cracks of wall blocks! The only way for anyone to be able to forge inscriptions in the cracks of wall blocks would be if they tore out the interconnecting blocks – which is not dissimilar to tearing down the whole top structure of the pyramid, because the system of relieving chambers is effectively resting on the top of the wall blocks. Another argument by the same author concerns inscriptions running over several blocks. He maintains that the presence of such inscriptions effeectivrly demolishes the idea of quarry marks, so thy must date from a later time. Therefore, they cannot be anything other than forgeries.. This would undoubtedly be an excellent argument... if such inscriptions actually existed. I searched every single ülate in both Perring and Vyse that showed the inscriptions, but I was unable to find a single inscription running over several blocks. 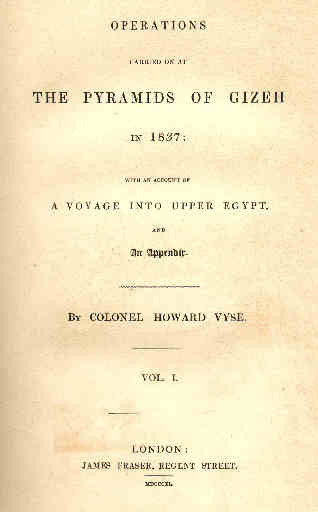 Readers can try for themselves, on this table page you can find all inscription-tables from Perring's "Pyramids of Giza". I was able to find 11 (eleven!) inscriptions that vanished behind floor blocks. Not only cartouches, but also normal, run-of-the-mill "uninteresting" hiroglyphics. Table IV shows two "cropped" cartouches which probably continue on the now hidden part of the block - but no inscriptions running over multiple blocks. Those lines are not without interest. There are six of them shown on plate VI top and bottom. 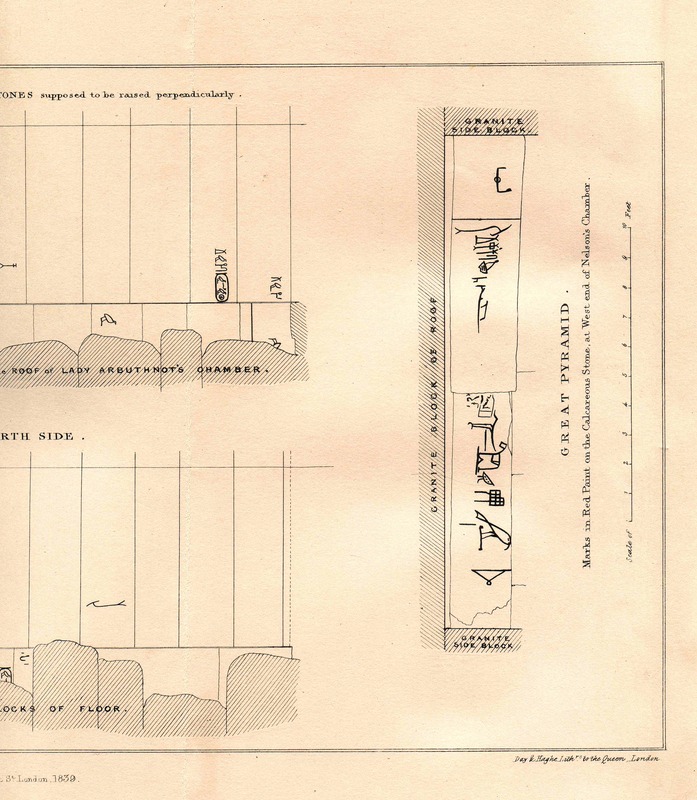 Three of these lines disappear out of sight behind floor blocks, clear evidence that they were drawn after the wall was finished, but BEFORE the floor blocks were put into place. Even better: the lines continue over the inscriptions and behind the floor blocks, revealing in which order the work was done! So close scrutiny of the plates presented us with sixteen further pieces of evidence contradicting the forgery hypothesis. This doesn't bother authors like Ralph Ellis, though. They simply turn the argument around. Because the name of Khufu is written on the Abydos Kings List with a solid disk similar to the solar disk, Ellis claims that the king in question really WAS called Re-ufu, and that the name "Khufu" in the relieving chambers therefore clearly shows that it is evidently forged. Khufu was somewhere else, living at another time. I asked Ellis, why a King Reufu is nowhere found in the archaeological records. He couldn't answer that: all he could say was something along the lines of "absence of (documentary) evidence is no evidence of absence (of Re-ufu)", and that would have no effect whatsoeve on his argument for a forgery hypothesis. I then asked him, why the clearly traceable King Khufu, named in many mastabas around Giza, was not mentioned on the Abydos list? Ellis' answer was that: Khufu was quite simply of such minor consequence that the Egyptians weren't bothered about including him on the lists. Ouch, that really hurts! [2 ] Stadelmann, Rainer; Die Ägyptischen Pyramiden, Kulturgeschichte der antiken Welt Bd. 30, Zabern 1997 (3. aktualisierte und erweiterte Auflage), Table 35a, enlargement of "CH" done by author. 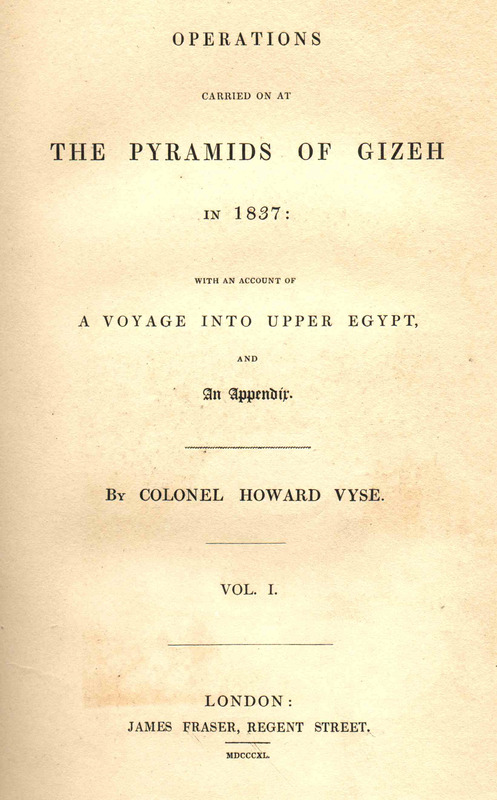 [6 ] Vyse, Howard; Operations carried out on the great Pyramid of Giza in 1837, London 1937, Vol. I, Plate "Hieroglyphics"